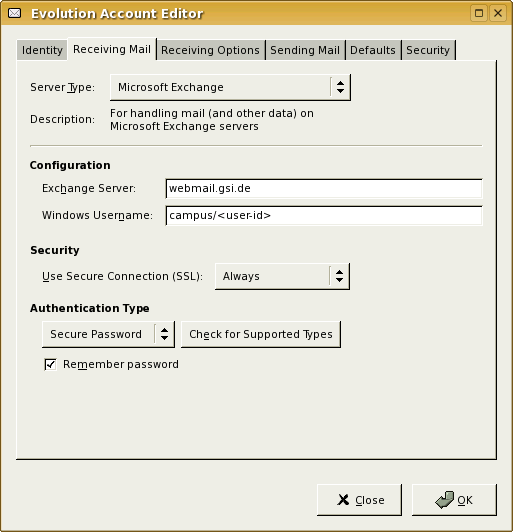 These instructions are explaining how to access your mailbox on the GSI MS Exchange server. Actually they are not specific to Exchange and should work with any IMAP mail server. Make sure you use encryption via SSL/TLS whenever it is available. After you have successfully setup your mail reader, you may want to use it with encryption. Have a look for it here. You may access your mailbox on the MS Exchange server using the IMAP protocol. 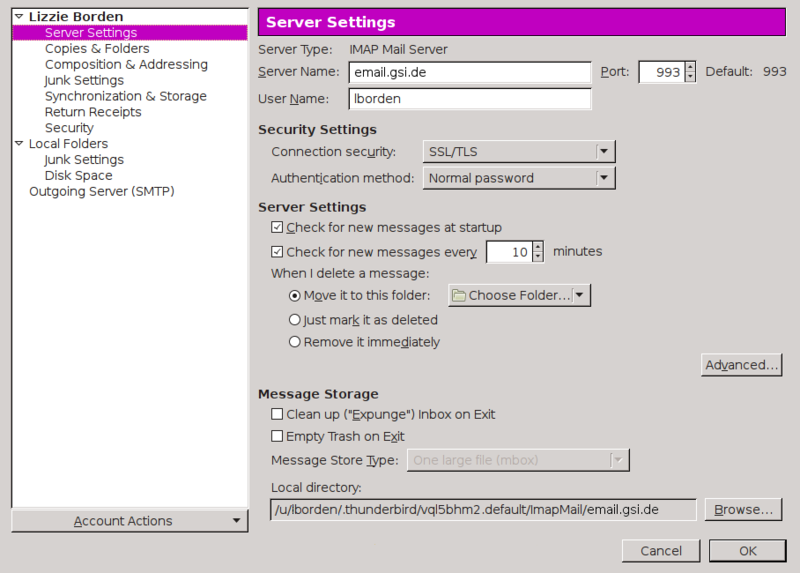 The hostname of the incoming mailserver is email.gsi.de. Use your Windows account and password to login. You may but do not have to prefix the user id with the Windows domain name (i.e. campus\). From outside GSI you have to switch on SSL encryption (Port 993) to access your mailbox (recommended also inside GSI). Use email.gsi.de for sending mails via SMTP: You have to enable TLS encryption (TCP port 587) and Authentication using the same credentials as for IMAP. 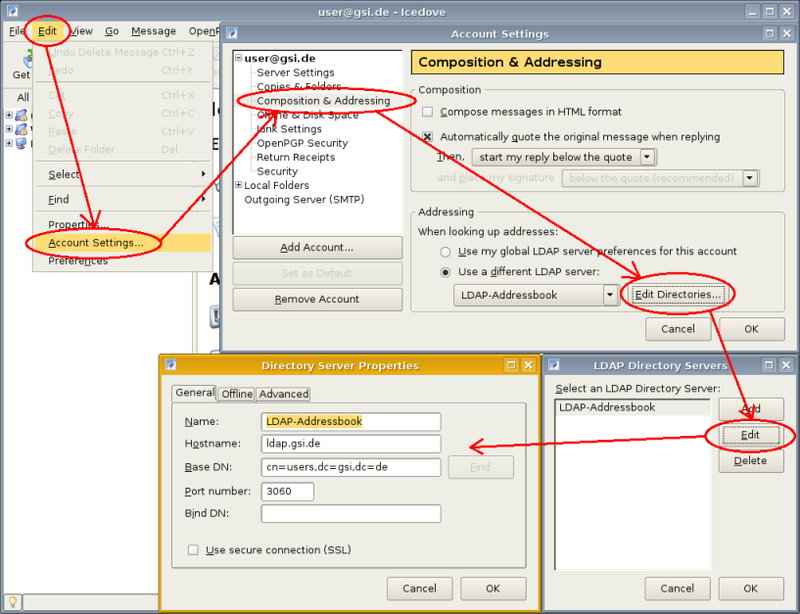 You can also use smtp.gsi.de (Port 25) as your outgoing (SMTP) mail server without authentication from inside GSI. smtp.gsi.de does not accept mails with @gsi.de sender addresses from outside. Most of the Linux mail readers will also support sending via localhost (so called sendmail transport). Use of encryption (SSL) is also recommended for GSI internal access, otherwise your Windows password will be transmitted unencrypted! The initial password you receive upon account registration will not work! You'll have to login to Windows first and change the password (e.g. use the Windows terminal servers). If you accidently mistype your password, your account will be locked after ten login attempts. Use your official GSI mail address (defaults to: Inital dot Surname @gsi.de) only. Otherwise replies won't get back to you. Import the GSI SSL root certificate for email.gsi.de. The configuration of Mozilla Thunderbird and Debian Icedove mail reader are mostly identical. If you start the mail reader for the first time, a wizard window will open. It asks you about name, e-mail address, login name and password and tries to guess the mail servers and settings automatically (click to enlarge). After clicking Continue you may use the button Manual config to edit the entries (e.g. 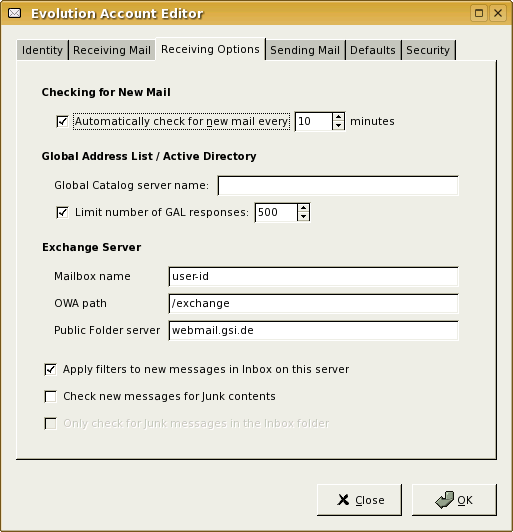 setting the name of the outgoing mail server to email.gsi.de) (click to enlarge). And there is a button for Advanced config. The latter leads to the same window you get by clicking Edit - Account Settings... in the main window (click to enlarge). Click Ok to proceed with the setup. You should then have a new subtree in the mail reader window containing you Exchange mailfolders. Start the KDE Control Center. Under Security & Privacy select Crypto and the register SSL Signers. Import the Certificate and activate Accept for site singning and Accept for email signing. Since Version 2 evolution proviodes a plugin for native communication (formerly known as Ximian Connector). Unfortunately this version is not yet available for the LinuxFarm. Additional Documentation on the setup is available from Novell. The exchange plugin solely relies on WebDAV communication with Exchange's Outlook Web Access module and therefore works through a firewall without problems. Configuration: Add a new mail account under Tools -> Settings... -> Mail accounts and fill out the tabs with the appropriate settings as shown here. For Mozilla simply replace firefox with mozilla. For Konqueror use kfmclient newTab %s, which will open the link in a new tab. This may be configured in the Gnome Control Center as well if Gnome is fully installed. mutt is certainly the most advanced text-mode mail reader. It was derived from elm but has much more features, especially IMAP support. For more information read the Manual. Additionally you may add set imap_pass...= to your .muttrc. It's understood that this is not at all recommened, anyhow if you choose to do so make sure your .muttrc is not readable to anyone but yourself. in your .muttrc file. Thats it! Make Pine use the IMAP server for its inbox. Enable Pine to browse the mailfolders on Exchange. Folder on "email.gsi.de/ssl" to use for INBOX [inbox] : [Enter]. Select eXit/Save [Ctrl-x] to save your changes. Pine knows folders (something that contains messages) and directories (something that contains folders). With separate-folder-and-directory-entries enabled Pine will recognize mailfolders that contain both subfolders and messages: They will appear two times in the folder list - as a folder and as a directory suffixed with a /. Also it should be handy to check quell-empty-directories to hide all directories that contain no further folders (These are only displayed once then). You should then also add the given email address to the alt-addresses option still further down that page. Otherwise pine will list the sender (you) instead if the recipient when displaying the Sent folder.